Our latest exhibition, Form and Function: the Genius of the Book, provides visitors with a true visual feast. Offering a wide array of different types of bindings from the Folger collections, exhibition attendees will learn about the techniques and materials historically used to cover books and make them functional objects. I’m fascinated by the internal structure of the sewing, but am forced to admit that my favorite part of this exhibition is the decoration on the covers. Most books in the early modern period were covered in plain or simply-embossed leather, vellum, or paper wrappers—these were the most practical, functional, and the least expensive. A small amount of books, owned by the very wealthy, were by contrast richly adorned with gold, complicated tooling, fine or exotic leather in different colors and patterns, textile, or paint. The price of the binding often cost more than the text itself. We’re often cautioned not to judge a book by its cover, but it’s difficult to ignore the softly shining, golden curves of a fanfare binding, the red velvet and seed pearls of delicate embroidery work, or the simple elegance of “Grolieresque” strapwork. 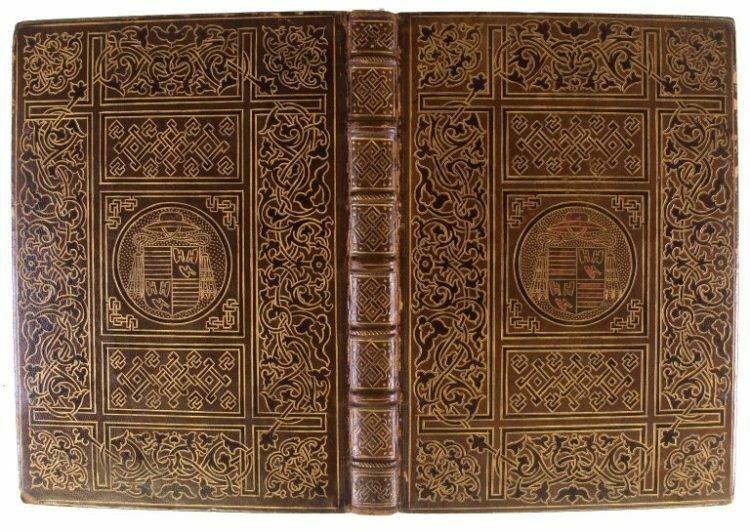 The skill and focus needed to produce a binding like these can only be achieved by someone who has truly mastered their craft, and the Folger has assembled a collection of fine bindings from the fifteenth century through the present day that represent the very highest skill. It’s easy to assume, even with such gorgeous and complicated works of art, that there’s nothing to hide with bindings: “what you get is what you see,” at least according to Tina Turner. However, two of the bindings in our current exhibition have a secret to hide—they’re three hundred-odd years younger than they look, and were made with the intent to deceive not only the casual viewer, but the most discerning collectors, librarians, and antiquarian dealers in the world. And for a short time, they succeeded. In 1875, London bookseller Bernard Quaritch, already recognized as one of the foremost names in the antiquarian world, and viewed by many as an expert in the field, began exchanging letters (now preserved in the British Library) with a French dealer named J. Caulin. 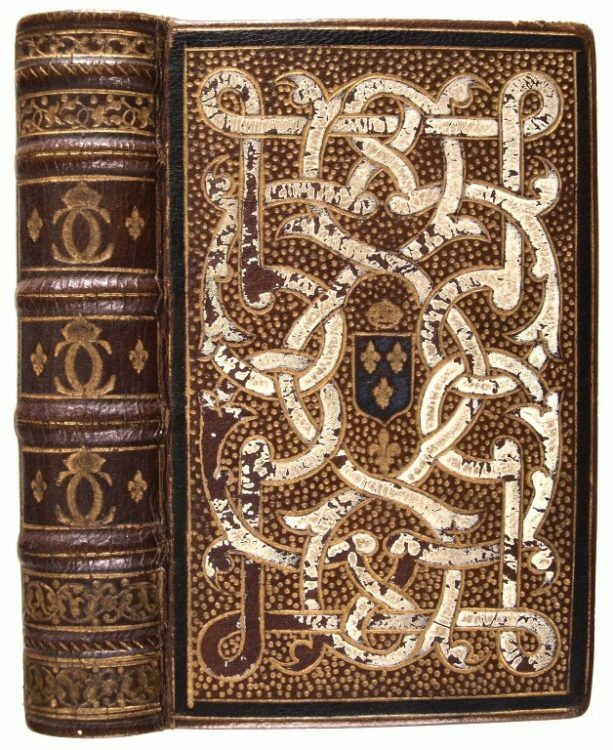 Caulin provided the most remarkable bindings for sale: bespoke, luxury items made for kings, popes, princes, Cardinals, queens, mistresses, and French nobility, painstakingly crafted by the finest, most skilled binders and artists of sixteenth-century France. These bindings were gorgeously colored and tooled in gold, with gilded, gauffered edges, and often included distinguishing coats of arms or crests that established their lineage beyond a doubt. Caulin appeared in particular to have a secret source for books that had belonged to the library of French king Henri II and Diane de Poitiers, his mistress. Although Quaritch could never sell the items for quite as much as the temperamental and demanding Caulin wanted, he ultimately sold thousands of pounds worth of Caulin’s inventory. Quaritch’s almost sole customer for these very special bindings was John Blacker, a London merchant who came to have an almost obsessive relationship with his collection, and who deserves his own sidenote for odd behavior. Reportedly, he went so far as to hide his books from the sight of anyone else in the house if they came into the room when he was “gloating” over them after dinner in the evenings, including his wife and children. He kept them in custom-made velvet and silk cases, interspersed with sachets of perfume, causing his daughter-in-law to compare his relationship with them to that of a lover and his mistresses. Blacker became so obsessed that he eventually went in search of the elusive Caulin himself. On his return to London, he reported in confidence to Quaritch that Mssr. Coulin was in reality a man named Théodore Hagué. The Folger owns two bindings that have been identified as Hagué’s work, although neither appear in the sale of 1897. The first is Folger 227- 140q, a copy of Conrad Gessner’s alchemical work Thesaurus Euonymi Philiatri, de remediis secretis…, published in Lyon in 1555. Based on the binding, this work clearly belonged to Catherine de Medici—the edges contain elaborate strapwork decoration enclosing her cipher, a crowned “C”, and the similarly elaborate strapwork on the front and back covers (painted white and artfully distressed) contains her coat of arms. The little book is gilded and tooled almost within an inch of its life, with a fancy semé background of small golden dots and a heavily-decorated spine. Acquisitions staff purchased the binding as an example of Hagué’s work in 1986, and it is featured in our catalog Fine and Historic Bookbindings from the Folger Shakespeare Library under a section on forgeries 5. The second item is Folger B430 .T49 1519 Cage (folio), a copy of St. Thomas Aquinas’s Commentary on Aristotle’s Nicomachean Ethics published in Venice in 1519. This item supposedly belonged to a wealthy Cardinal—it is meant to imitate a seventeenth-century Italian binding, the brown goatskin of the base is covered in floral and knotwork designs, again perfectly gilded and painted in an elaborate pastiche. The Folger acquired this item in 1954 from a British dealer. It’s uncertain, based on our acquisitions records, whether the dealer or the Folger staff knew at the time that this was a nineteenth-, not a sixteenth-, century binding. The dealer provided no description in the list presented to the acquisitions department, although he offered to do so “on request.” The Head of Acquisitions at the time, Eleanor Pitcher (a seasoned purchaser and nobody’s fool), was traveling in Great Britain when the order was drawn up and sent “on approval.” We can only guess at the conversation she may have had with the dealer if she saw the book in person, but clearly the book was kept regardless of her seeing it in the UK or back in Washington, DC. Apparently, if she did know, she didn’t think Hagué or the binding were worth noting in the acquisitions records. Folger B430 .T49 1519 Cage Fo. Both of these items, as mentioned earlier, are currently on display in our Great Hall, alongside books produced in nearly every century since 1450. This includes the items they’re meant to mimic: actual seventeenth-century Italian and sixteenth-century French bindings. So although they were produced by a nineteenth-century binder and not someone working three hundred years earlier, does that make them any less worthy of display or consideration than the “real thing?” These bindings are now a part of the history of the texts, whether or not they actually belonged to Catherine de Medici or a wealthy Cardinal, and they took as much time and skill to create. As Hagué discovered, and used to his merit, the true value of an item is in the eye of the beholder. Although Théodore Hagué’s work undoubtedly caused a great deal of emotional pain and financial loss, he was nonetheless a superb craftsman. We hope you will come see these examples of his work for the short time they are on display, and appreciate them, even as (incredibly) those who were most harmed by his actions did. Paul Eudel, Le Truquage, Dijon: Darantiere (1884), 264. Citation refers to the 1907 edition. Foot, Mirjam, “Double Agent: M. Caulin and M. Hagué,” Book Collector, Special Edition for the 150th Anniversary of Bernard Quaritch (1997), 136-150. Mirjam M. Foot, Carmen Blacker, and Nicholas Poole-Wilson, “Collector, dealer, and forger: a fragment of nineteenth-century binding history,” in Eloquent Witnesses: Bookbindings and their History, ed. Mirjam M. Foot (Oak Knoll Press: Newcastle, DE, 2004), 264-281. My thanks to Dr. Erin Blake for information about the image processes in this catalog.